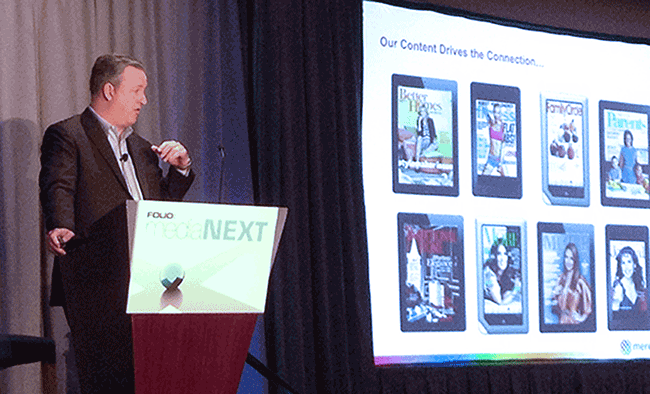 How does a magazine publishing company survive and thrive in the digital age? By changing with the times without betraying its core mission. On the one hand the company must engineer editorial to meet the requirements of delivery channels such as social media and mobile apps, molding its product to conform to and exploit the limitations and potentialities of tablets and cell phones. On the other hand the publisher must maintain and exceed a level of editorial integrity and service that over the years have built core audience loyalty. Known for its century-old titles such as Better Homes and Gardens and Ladies Home Journal, Meredith has been engaging in a modern day balancing act, reengineering content for the digital age while maintaining firm control over reader-focused editorial. In this royal court of publishing the Crown may be digital but the King is content. “We are not a technology products company,” Harty emphasized. “We are a content company. The curated and trusted content of our magazines and our digital media drive our connection with our core audience of 100 million women. At the end of the day we have to deliver on our brand promise.” The “crux” of Meredith’s strategy to fulfill that promise is the provision of content aligned with what Harty describes as the “three main focuses” of the company’s readers: family, home and well being. Equally compelling is the transformation in editorial. Mature and seasoned as it is, content continues to evolve in subtle ways as readers exploit technology to gain an interactive presence. “In today’s media world people view your brands more as a daily content experience,” said Harty. Escalating patterns of reader interactivity offer opportunities for a closer engagement of editorial with consumer needs.